The most relevant and important way of HDP pipes use is gasification. This fact is explained by gas impermeability of polyethylene, by its physical and chemical durability. The preference is given to polyethylene pipes in the areas where the exploitation is realized at freezing temperatures. Polyethylene pipes for gas pipeline are produced from low pressure polymer with high density according to GOST 50838-2009. 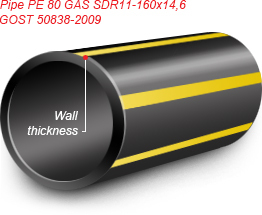 HDP gas pipe is painted in yellow or black color (with equally placed marks all around made by yellow axial lines). Polyethylene pipes are used for the transportation of gas and gas-air mixtures (industrial and commercial purpose), which do not contain nonmetallic aromatic chemical elements. The method of HDP gas pipes installation is only under the ground. Interdiction for above the ground mounting is explained by the aggressiveness of above the ground environment – polyethylene is unstable to the impact of ultraviolet radiation which reduces exploitation period and firmness rate. Polyethylene gas pipes are quite strong and their operational lifetime is more than 50 years. HDP items don’t lose their properties under the impact of low or high temperature. Softening of the polyethylene starts only at the temperature of +80 °С. Plastic which does not afraid of corrosion is easily used for installation of gas systems in marsh areas and under the conditions of high humidity level. Gas pipe does not require any additional insulation in humid place; it also will not be damaged by the roots of the trees. Another advantage of HDP pipe for gas transportation is its light weight which facilitates mounting and does not require any special equipment for loading/unloading. The lightness of a polyethylene pipe will surprise a person who is really far from the records in power lifting. 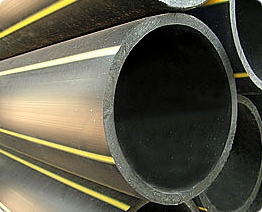 The choice of polyethylene pipes to organize gas pipeline is determined by the following: environment friendliness, tightness, service life, resistance to corrosion, light weight, low cost of HDP pipes themselves and their mounting, availability of joining details, «steel-polyethylene» adapters, and resistance to deposits adhesion. Elasticity of polyethylene pipes for gas pipelines protects them from deformation during the soil flows and earthquakes.